Thiurvallikkeni Emperuman Thirumanjanam at Eekkadu 2017 "ஈக்காடுத்தாங்கல் திருவூறல் உத்சவம்". Today 22nd Jan 2017 is a tough and demanding day for the kainkaryabarars of Thiruvallikkeni – the sripadhamthangigal, Battar, Adhyapakas, various others engaged in doing service to Emperuman – for it is a long journey crisscrossing the city, on the day much was happening at Marina beach. Singara Chennai has rivers - Adyar and Coovum flowing through. River Adyaru starts from Malaipattu tank near Manimangalam village in Sriperumbudur Taluk at about 15 kilometres (9 mi) west of Tambaram. It starts to appear as a stream only from the point where water from Chembarambakkam lake joins the river. It flows through Kancheepuram, Tiruvallur and Chennai district for about 42.5 kilometres (26.4 mi) before joining the Bay of Bengal in Adyar, Chennai. Here it forms an estuary, which extends from the Adyar Bridge to the sandbar at the edge of the sea, with some small islets in-between. The British used to call it Chengalpattu river as it came from the direction of Chengalpattu. Lakhs of Chennaites cut across the river using the Thiru Vi Ka Bridge and Maraimalai Adigal bridge ! –wonder where they are ? – near Malar Hospital is the former and at Saidapet is the latter. The earliest causeway across the river was then known as Marmalong Bridge, originally constructed by the Armenian merchant Coja Petrus Uscan in 1728 at the cost of Rs. one lakh. Over the years it became weak and was replaced by a new one in 1966, then named after Maraimalai Adigal. Nearer Guindy is Industrial estate and on the banks of the river Adyaru, is Ekkadu. 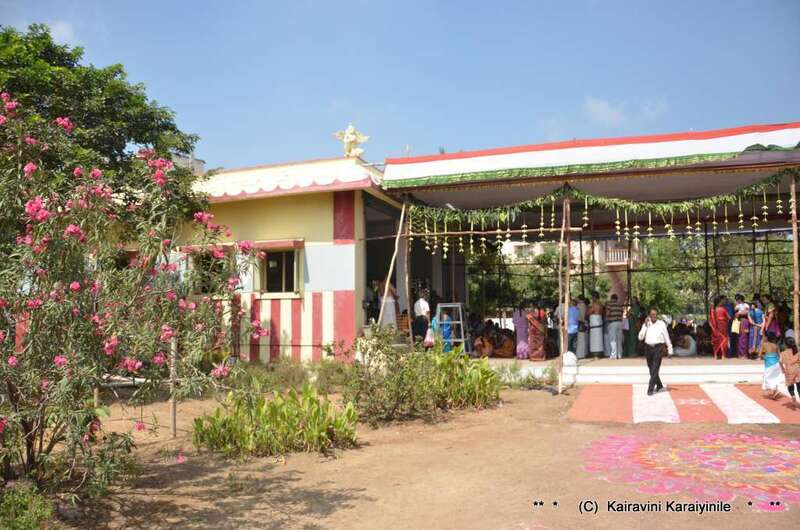 Every year on a day, whence there are no other regular Uthsavams, on a Sunday, Sri Parthasarathi Perumal leaves on a sojourn early in the morning, has many mandagpadis on the way – has Thirumanjanam at Ekkattuthangal in a land donated to Him many decades ago. திருவல்லிக்கேணி திவ்ய தேசத்தில் : நித்யப்படி, மாதந்திர, வருஷாந்திர உத்சவங்கள் பலவும் சிறப்புற நடைபெறுகின்றன. திருநக்ஷத்திரம் கணக்கு இல்லாமல் நடக்கும் ஒரு சிறப்பு உத்சவம் "ஈக்காடுத்தாங்கல் திருவூறல் உத்சவம்". கிண்டி அருகே உள்ள ஈக்காடு தொழிற்பேட்டை பிரசித்தி பெற்றது. இது அடையாறு ஆற்றங்கரையில் உள்ளது. ஸ்ரீ பார்த்தசாரதி பெருமாள் பிரதி வருடமும் ஒரு நாள் இங்கு எழுந்து அருள்கிறார். மாசி மாதம் மற்ற சிறப்பு உத்சவங்கள் ஏதுவும் இல்லாத ஒரு ஞாயிற்றுக் கிழமை இவ்வுத்சவம் நடைபெறுகிறது. இவ்வருடம் இவ்வுத்சவம் இன்று 22nd Jan 2017 , சிறப்புற நடைபெற்றது. Here are some photos of the place, the ensemble of bhagavathas assembled here and of the holy Thirumanjanam. 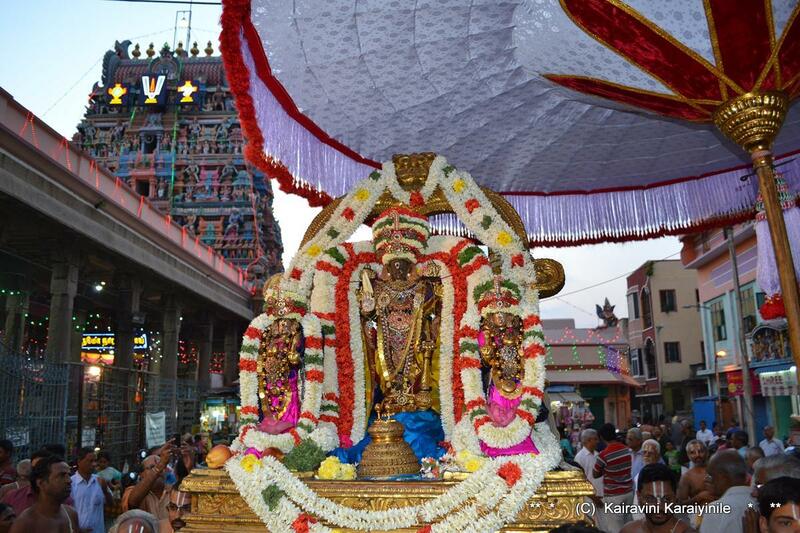 At Thiruvallikkeni Divyadesam there are daily, monthly, yearly uthsavams. Most of them occur on specific nakshathiram. Today [night of 21.1.2017 ~ rather early morning of 22.1.2017] is ‘Eekkadu Thangal Thiruvural Uthsavam’ – which has no connection with any nakshathiram. Eekkadu Thangal near Guindy is an area known for its industries and it lies on the bank of Adyar river. Every year, Sri Parthasarathi visits this place. This Uthsavam is held on a Sunday in the tamil month of Maasi, when there are no other special uthsavams. This year on 22nd Jan 2017 was this grand festival. There were different scenes at Marina beach, protests on for Jallikattu, there was perceivable feeling on air that in the past few days, it was taking a different turn hearing the sort of voices and distinct lack of single leadership. Away from this was the scene when hundreds were inside the Temple for Kalasanthi theertham and goshti. Sri Parthasarathi after Mylapore, goes via Alwarpet, T Nagar, Kodambakkam, Mahalingapuram, Saidapet and finally reaches Eekkadu Thangal where Thirumanjanam is performed. The purappadu is now on.. Here are some photos taken this morning. He comes out in new pallakku ! 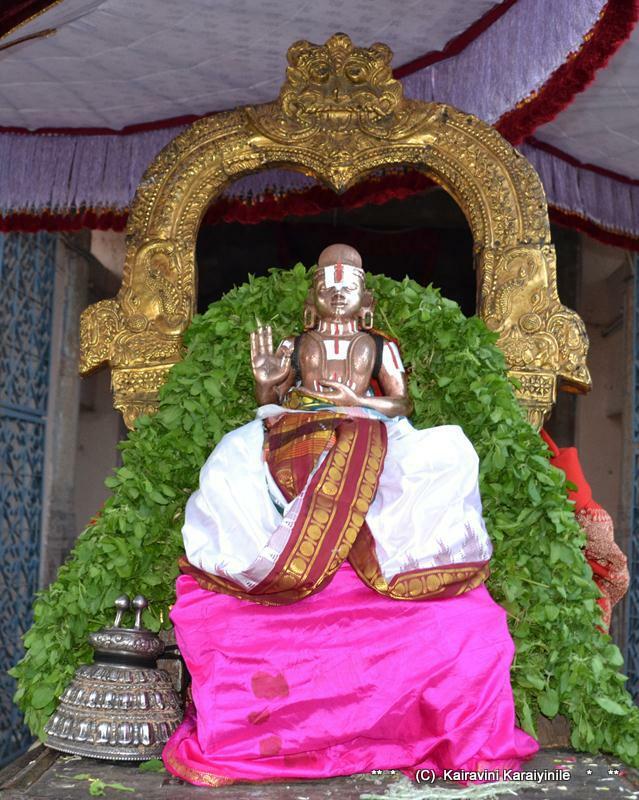 Irapathu day 10 ~ Sarrumurai – Nammalwar Thiruvadi Thozhal. Today, 17th Jan 2017 marks the culmination of Irapathu Uthsavam. 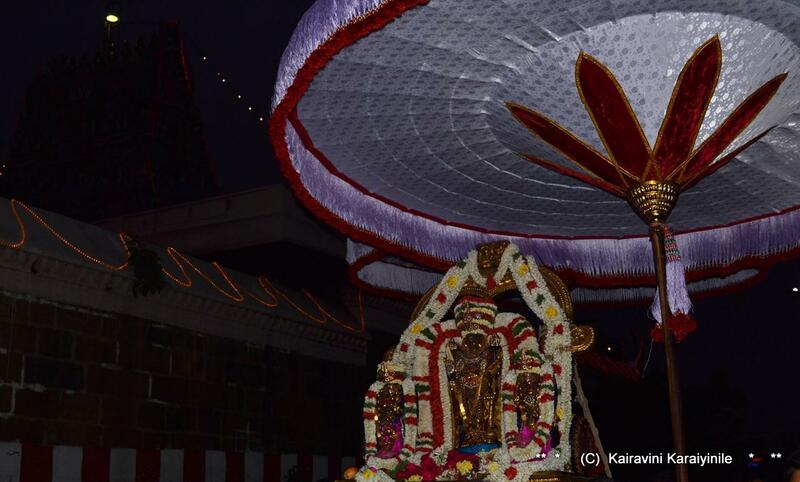 The latter part of Adhyayana Uthsavam – ‘Irapathu’ sarrumurai is performed today. 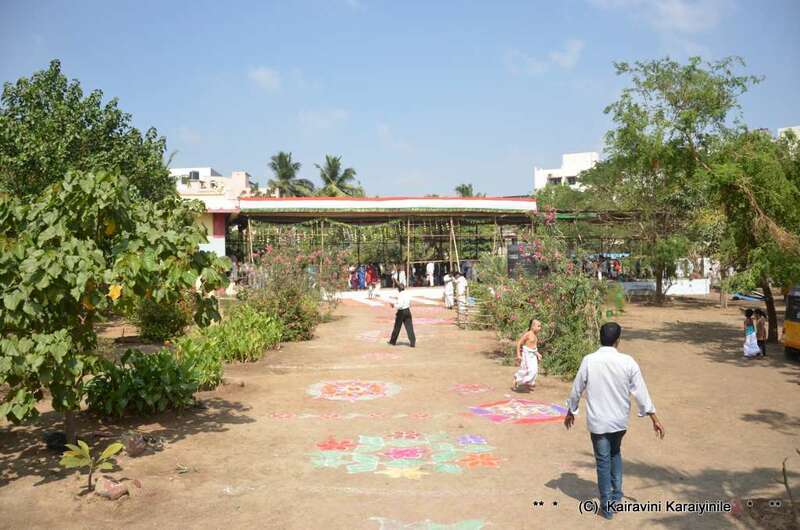 This grand fete is performed for Swami Nammalwar and the 10th day is very significant for the “Thiruvadi Thozhuthal”. 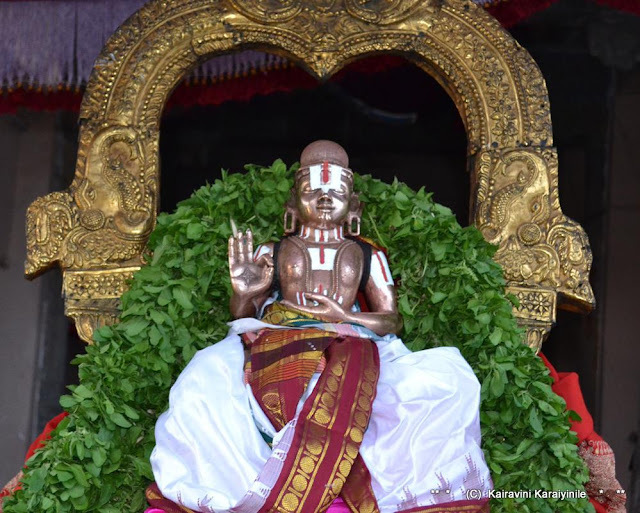 On all the days of Irapathu there was purappadu in the evening – and it is Swami Manavala Mamunigal’s ‘Upadesa Rathinamalai’ in the goshti… Today, Swami Nammazhwar could be worshipped in his Thirumeni without kavacham. After Thiruveedhi purappadu, inside the Temple in the famed ‘Thiruvadi Thozhal; Swami Nammazhwar’s entry of Mokshapuri after a great life on this earth – as he himself sung ‘வைகுந்தம் புகுவது மண்ணவர் விதியே’ [vaikuntham puguvathu mannavar vithiye’] would be enacted. Swami Nammalwar’s Thiruvaimozhi is of vedic excellence, elucidating the desire of Jiva in attaining the Supreme Lord. Alwar has given us thousands of sweetest hymns in Tamil with which we can forever engage in praising the glory of Lord. – and in case, you nurse any doubt of the sins, troubles, of death, illness and more – the solution is too simple ! : all our ills, obstacles, fears, sins will simply vanish upon uttering the name Kesava. The wicked Yama’s messengers will not dare to come near and all troubles will go away for those of us, who utter Kesava, go and prostate before that Lord at Thiruvananthapuram who reclines on the serpent capable of spitting venom. Think, utter, chant, tell loudly – “Kesava” all the time. கொடிய இடரென்று பேர் பெற்றவையெயல்லாம், கேசவா வென்று மூன்றெழுத்தைச் சொன்ன வளவிலே கெடும் ; கொடுவினைகளை தரும் யமனை சேர்ந்தவர்கள் பக்கலில் கூட நெருங்க மாட்டார்; அழகான வயல்கள் சூழ்ந்த திருவனந்தபுரத்திலே தானாகவே விரும்பி, கொடிய நச்சை உடைய அரவத்தை மேல் துயில் கொண்டருளும் பெருமானை கேசவா என்று கூவி, அத் திருப்பதியிலே சென்று புகுந்தால் போதும். Collaged photos (3) of Swami Nammalwar. In the middle Nammazwar is without kavacham, taken during the 10th day purappadu – scintillating darshan of his Thirumeni without kavacham adorning a single Thiruthuzhai maalai. 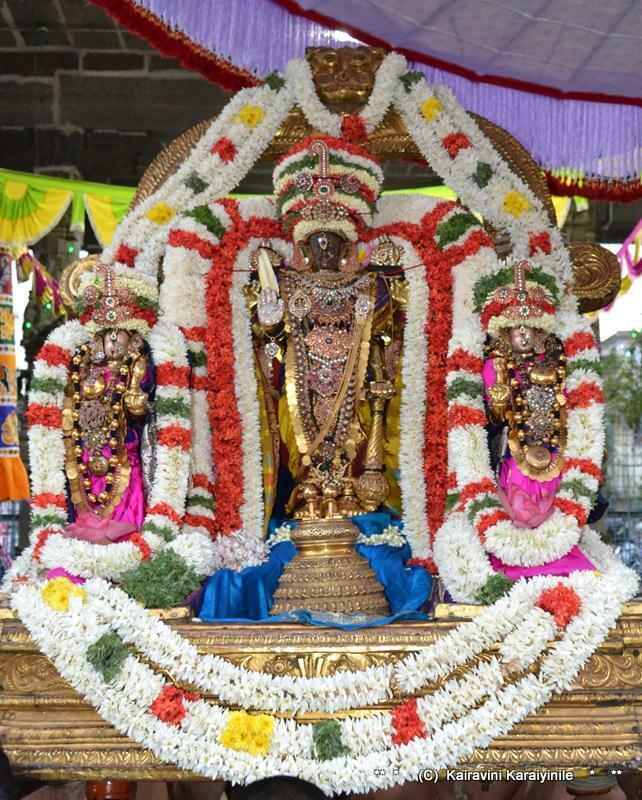 …and one cannot miss the Sublime beauty of Sri Parthasarathi oozing exceptional kindness in delicately made floral arrangement including the decorative crown made of choicest flowers and the dazzling ornamanents. Blessed are those who could have darshan of Him in any form. 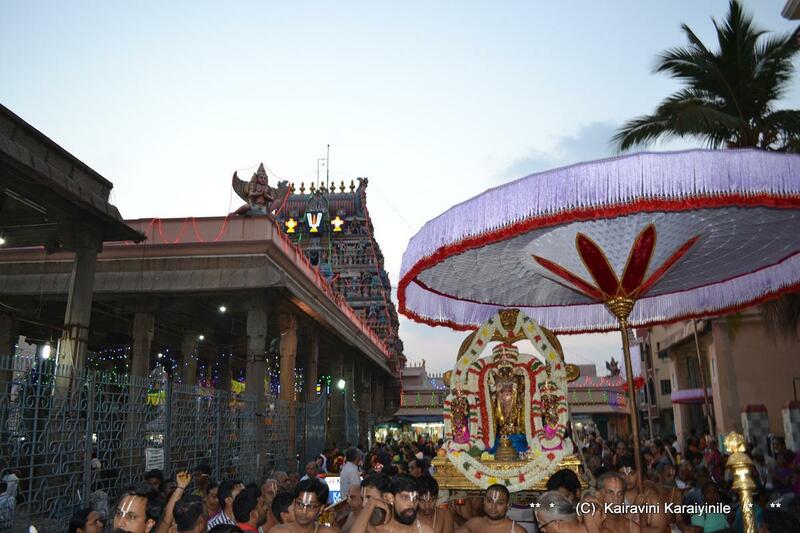 Today (16th Jan 2017) is day 9 of Irapathu uthsavam at Thiruvallikkeni. Lord Krishna right from His childhood days exhibited magical qualities revealing that He is the Supreme Power; yet He mingled with cowherds and all other folks treating all as equals ~ such is the great quality (Saulabhyam) of Lord Krishna, being accessible to mighty and meek without disparity. குப்பாயமென நின்று காட்சிதரும் கோவர்த்தனமென்னும் கொற்றக்குடையே. The most benevolent Maha Vishnu (embodied as Lord Krishna) upturned the big mountain just as an umbrella – He spread his five fingers of lotus hand which were akin to spokes and His long arm seemingly the stem. With the mountain so held protecting the cows and cowherds, the gushing stream of water flowed down over the rims forming a tassel of ornament… the sprayed waters formed looked like a silken coat with pearls interlaced and worn by the might Lord… that was the lifting of Govardhana Giri. 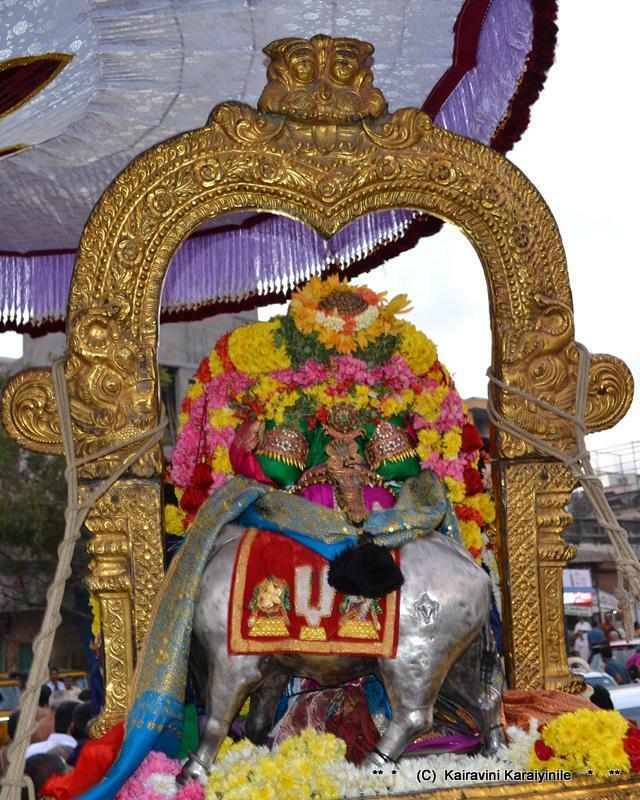 Thirumangai mannan in sthala pasuram of Thiruvallikkeni mentions thus : One of the annual celebrations of the cowherds was feasting where Indra was worshipped; as it was not forthcoming, Indra got wild and rained hailstones. The cowherds ran to their natural protector Lord Krishna, who held aloft the Govardhana mountain with his finger and ensured protection of all the people. 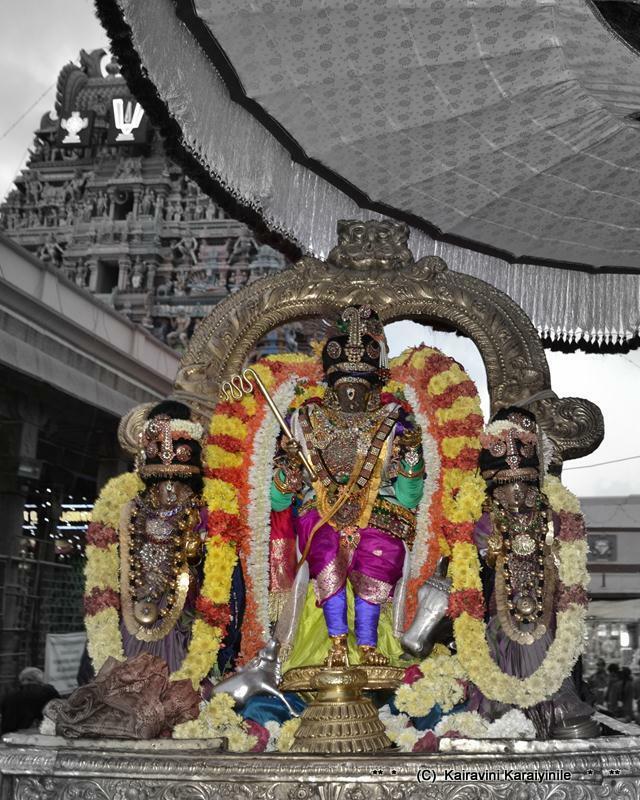 Thirumangai Mannan says, that it is this Krishna who is before us at Thiruvallikkeni divyadesam. அந்தமில் வரையால் மழைதடுத்தானைத் திருவல்லிக்கேணிக் கண்டேனே. 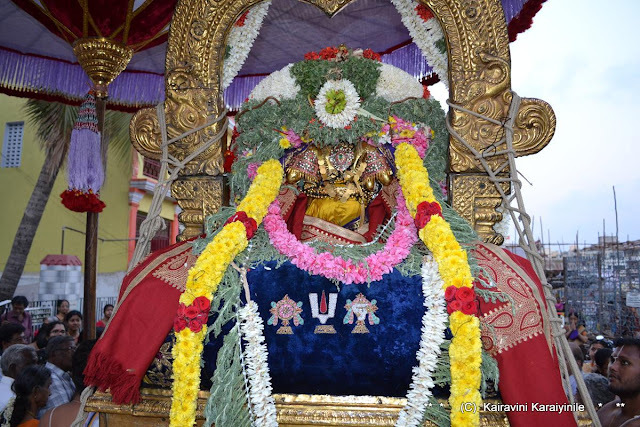 Today, it was such a great sight to behold - Lord Parthasarathi bedecked beautifully portraying the lifting of ‘Govardhana Giri’ and saving all – the eternal Saviour and protector… here are some photos taken during the 9th day of Irapathu uthsavam and the reason for the Uthsavam Swami Nammalwar. 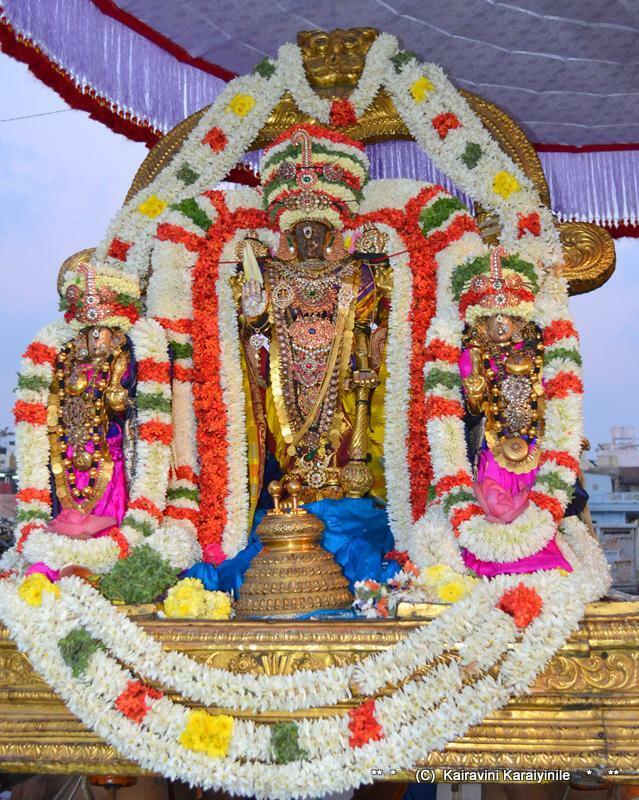 Today, the day of Mattu Pongal (15th Jan 2017) is the 8th day of Irapathu Uthsavam ……… today it was ‘Raja Mannar’ Thirukolam……….. it is but natural – Krishna was the King of cowherds and Sri Parthasarathi in His natural self…as Rajamannar, blessed His bakthas. The whip and the crowning glory were of unparalleled beauty – one could also notice the small calf at His lovely feet and the beautiful cow behind Him. The easiest way to reach Him, is surrender thyself (Saranagathi) ~ of the infinite kalyanagunas of the Emperuman – there is one of ‘Vathsalyam’ – the exposition of patience and forgiveness……… we make so many mistakes knowingly and yet our Lord protects and takes us nearer removing us of all the sins….. it is rendered that the cow would like the dirt off the calf revealing it’s extreme love for its progeny. So also Emperuman accepts us even when we are full of dirt and mistakes. We need to do nothing but surrender, prostrating at the divine feet of Sriman Narayana. He would besides giving us all the good things in life, give us the good mind to think of Himself of all the time during the day and night ~ and those of us who start feeling so, are the most blessed. Here are some photos taken during day’s (rather night) purappadu. Forgive adieyn for this collage - Wonder which Thayar is this on the left ? …. On right side of picture frame is Gotha Piratti, in all grace – and today is confluence of two major Uthsavams. Today 14th Jan 2017 is Sankranthi and every Pongal day, there would be ‘Sri Parthasarathi Andal’ Urgola Uthsava purappadu. Today is day 7 of ongoing Irapathu Uthsavam too – the occasion of Sri Parthasarathi Swami adorning Muthangi. 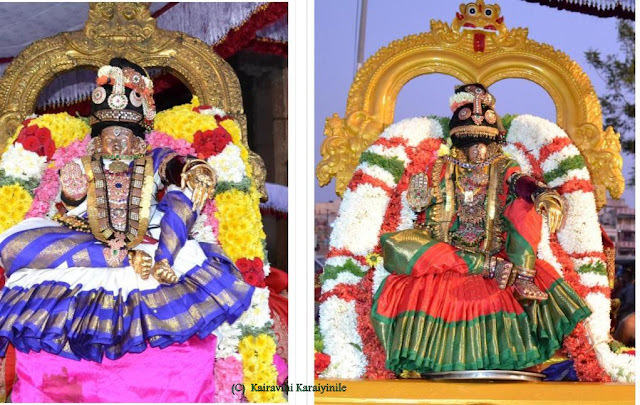 It is eternal bliss, indeed a feast to the eyes to have darshan of Paripuranan wearing a dress beautifully woven with pearls still unable to match the blemishless beauty of Perumal. ~ and alongside the astonishing beauty of Sri Parthasarathi was Sri Andal, in a composed sitting posture, all grace and karunyam for the bakthas. In front, there was the divyaprabandha goshti chanting Mamunigal’s Upadesa Rathinamalai and before, led Swami Nammalvar in Nayika bhavam ‘Nachiyar Thirukolam’ dressed as the woman [Parankusa Nayaki] hailing the greatness of Sriman Narayana. செங்கயல்பாய்நீர்த் திருவரங்கத்தாய், இவள்திறத்து என் செய்கின்றாயே? Swami Nammalwar praises the Lord at Thiruvarangam, the place which abounds with beautiful fishes in the holy river Thiru Cauvery. Thinking of the Lord holding the Conch and Chakram, she doles out tears handful ~ knows not sleeping, thinking of Him through day and night and cannot imagine a living without Him. Here are some photos taken during today’s purappadu, which could ever be the greatest feast to the eyes of a Bagavatha yearning for darshan of Emperuman, His consort Kothai Piratti and Alwar who was born in Thirukurugoor and who uttered the divine Thiruvaimozhi that innately has the nectar of Muththamizh hailed as dravida veda.